Talk about a timely show, given our prickly political season: 1776 has been staged by Dramaworks in a stirring, “reimagined” version with top notch acting and singing talent. It is THE musical of the year in South Florida. The show was written during its own contentious times, the Vietnam conflict, and also when the musical theatre was in a lengthy transition period, the days of Rodgers & Hammerstein in the past and at the dawning of the age of Sondheim, with Hamilton lying in the future. I mention these as there is a dotted line to all. However 1776 stands on its own as an innovative musical and although it has some long dramatic stretches between musical numbers, its inspired songs fit perfectly with “the book.” It is in the tradition of some of Broadway’s best since Rodgers & Hammerstein changed the course of musical theater. And now Dramaworks has augmented it with several innovative concepts, including a clever opening, the cast in modern dress, clutched to their smart phones and iPads, images of MSNBC and FOX news and important moments of electioneering history projected in the background, wondering whether political acrimony has always been the norm in America. 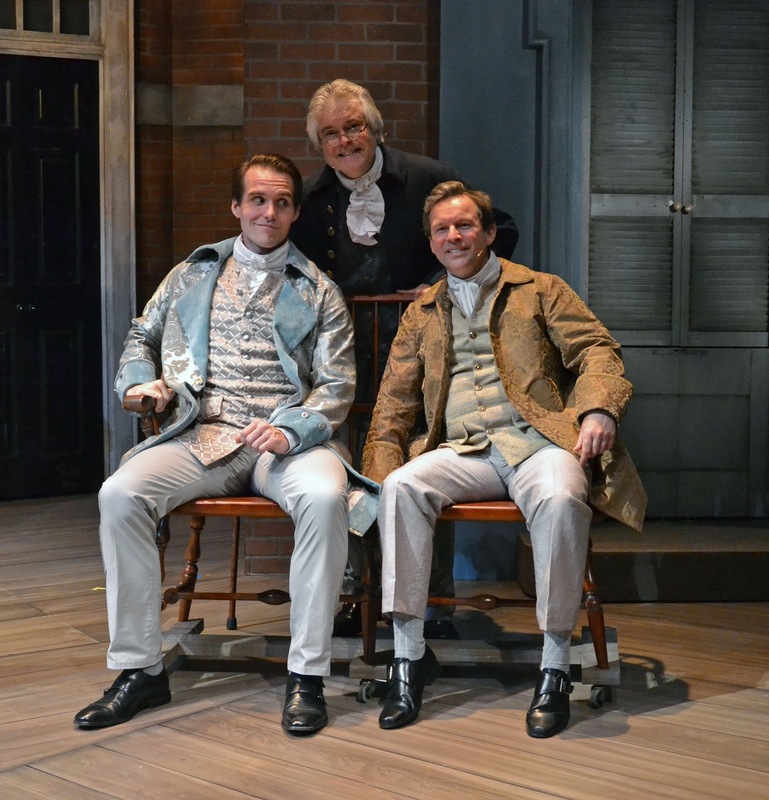 Costume changes on stage bring them into the Continental Congress and so begins the journey of discovering that the here and now is not that dissimilar to the then and there. 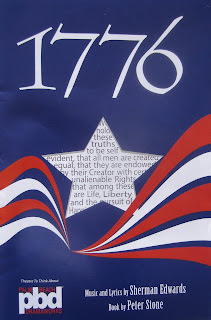 1776 portrays our founding fathers as real people. It was conceived by Sherman Edwards who at one time taught high school history and wrote the music and lyrics. The brilliant book was written by Peter Stone who chronicles the event with dazzling drama, tenderness, and abundant comic elements. There are the blue and red states, each with axes to grind, federalism vs. state’s rights, but, debate, commitment and compromise inexorably drive the production’s calendar pages to July 4, 1776 so we all know how it ends. The show is about how we get there. Suffice it to say, one wonders whether we would have a nation at all if today’s dysfunctional congress was arguing the case. It invites comparison to today’s musical sensation, Hamilton, which we were fortunate enough to see last year. Hamilton’s “room where it happened” is about a grand compromise - the assumption of debt by a new national bank in exchange for placing the capitol on the Potomac whereas 1776’s “room where it happened” is about another grand compromise, striking the slavery clause for unanimity on signing the Declaration of Independence: two monumental moments in American History, two outstanding musicals on the subject, both ageless in their own right. 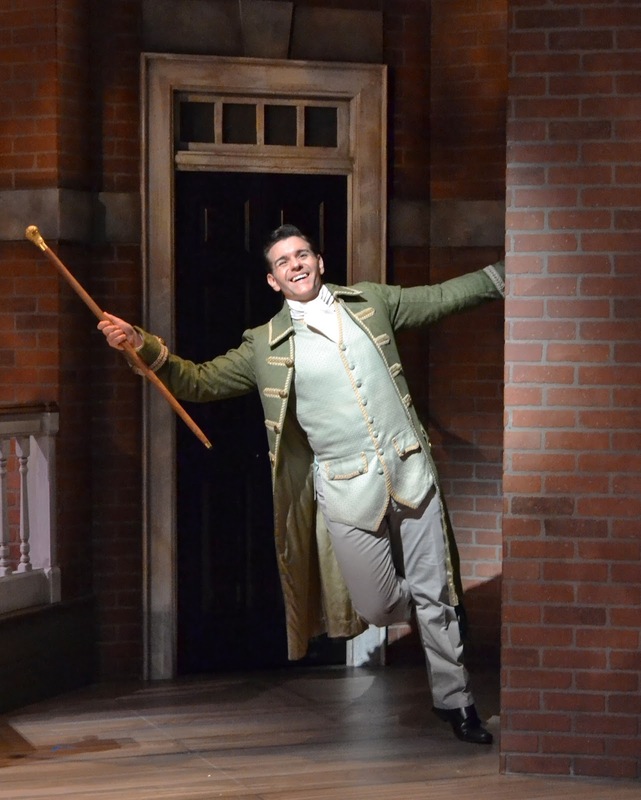 That was Lin-Manuel Miranda’s hat tip to 1776 and its opening number “Sit Down, John,” the lyrics which immediately grab you and bring you into the show, establishing its central character, an impassioned John Adams vs. the hot and tired Continental Congress and the themes of discord that run throughout the musical to its ultimate resolution. John Adams is compellingly played by Gary Cadwallader, the only actor in the show who has a singular role. He is on stage almost during the entire show -- a bravura performance! Most of the other actors play characters from the liberal and conservative sides of the aisle. 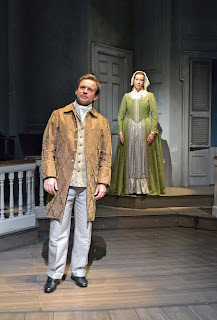 Necessity was the mother of a creative solution of staging this play with “only” 13 actors instead of the original show’s 26 and even having some of the female cast members play male roles, seamlessly, convincingly – sort of the same way the audience of Hamilton adjusts immediately to its multicultural cast. This conceit of playing parts from both sides of the aisle also challenges the confirmation bias that tends to permeate political views. Never shying from having to be “politically correct,” the satirical song “Cool, Cool, Considerate Men” elegantly portrays the right-wing members of Congress doing a minuet around the lyric "never to the left ... forever to the right." It was originally cut from the film version of 1776 because of pressure from Richard Nixon through the producer, Jack Warner. The song is led by the conservative leader from South Carolina, John Dickinson, delectably played by Nicholas Richberg. His other part is Richard Henry Lee of Virginia, singing the “deliciouslee,” “compellinglee” memorable “Lees of Old Virginia” with “hilaritee.” It is a show stopper and Richberg is a very talented young actor whose professional future is assured. Allegedly Nixon also wanted to excise the song "Momma Look Sharp," a plea from a dying soldier to his mother. Again, it helps to put the musical in the context of the times: the Vietnam War. This song was not cut. It captures the heartbreak and misery of war on a very personal level and you can hear a pin drop when it is hauntingly sung by the courier played by Mallory Newbrough, yet another young rising star. She also plays the passionate wife of Thomas Jefferson singing “He Plays the Violin” with exuberance and joy, dancing with Adams and Franklin. Remarkably she also has the minor role of George Washington reciting some of his dispatches to Congress. “Molasses to Rum” is a powerful piece about the struggle to include an antislavery clause in the Declaration of Independence which the northern states capitulated on to make the final compromise. The song incorporates auctioneer’s sounds of slave markets, and links ties to the northern states in the practice of slavery thus encapsulating the hypocrisy. It has to be one of the most devastating songs ever written about slavery, and its economics and pain. We wondered who could bring the voice and emotion to this song like the great John Cullum did in the original stage and film version, and fortunately the show has the experienced Carbonell Award recipient Shane R. Tanner to play Edward Rutledge of South Carolina who is definitely up to the task and the comparison. He also plays Dr. Josiah Bartlett representing New Hampshire. One of my favorite songs from the show is “Is Anybody There?” -- a lament sung by John Adams (Gary Cadwallader). While his sentiments come from the Adams’ letters to his wife Abigail, the title is from the dispatches sent by the weary George Washington to the Congress without action or reply. Although he is separated from his wife throughout the convening of the Congress in Philadelphia, she appears on stage for duets with Adams, always very dramatic and touching, their correspondence to song. 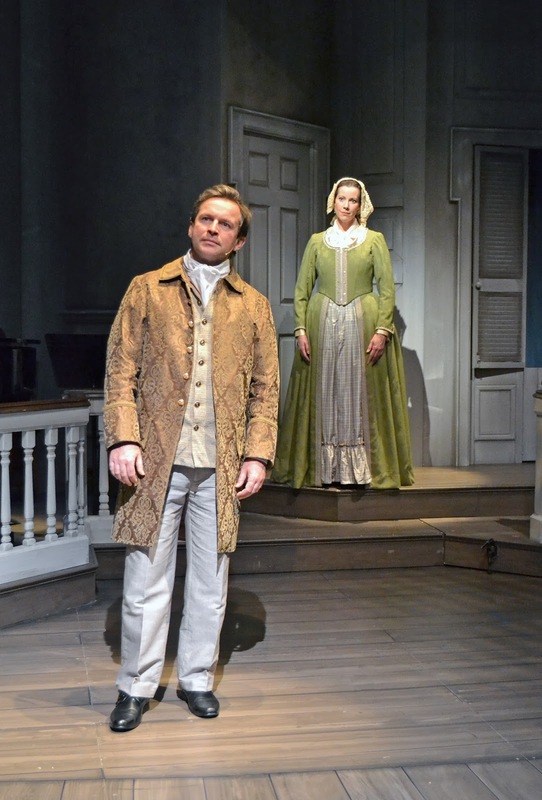 Abigail Adams is wonderfully depicted by four-time Carbonell nominee Laura Hodos who has a Broadway-class voice and seems ideally paired with Cadwallader. Her duet with him “Yours, Yours, Yours,” is heartbreakingly beautiful as they conclude the song with “Till then, till then/I am as I ever was and ever was/And ever shall be/Yours, yours, yours, yours, yours.” She also plays the critical role of John Hancock, the President of the Second Continental Congress, excelling in that role as well. Special mention goes to Allan Baker who plays the sometimes cynical and often bawdy, but always pragmatic and influential Ben Franklin as well as Clay Cartland who convincingly plays the aristocratic Tom Jefferson, pining for his wife and suffering from writer’s block until she appears. Mr. Cartland also plays Georgia’s Dr. Lyman Hall. The rest of the cast, without exception is terrific: Kevin Healey, Sandi Stock, Troy J. Stanley, Matthew Korinko, James Berkley, and Michael Collins (providing much hilarity as New York State’s Lewis Morris who repeats "New York abstains....respectfully” to all motions). The musical numbers reminded me of Sondheim with their harmony and internal rhymes. There is a touch of Gilbert and Sullivan as well. These are not the songs one immediately remembers as so many of Rodgers and Hammerstein’s, but they get under your skin and I find myself today while writing this review thinking about them and even singing (in my mind) Martha Jefferson’s “I hear his violin/And I get that feeling within/And I sigh, oh I sigh/He draws near, very near/And it's hi-hi-hi-diddle diddle/And it's goodbye to the fiddle/My strings are unstrung/Hi-hi-hi-hi/I'm always undone.” Just brilliant lyrics set to a wonderful waltz melody. 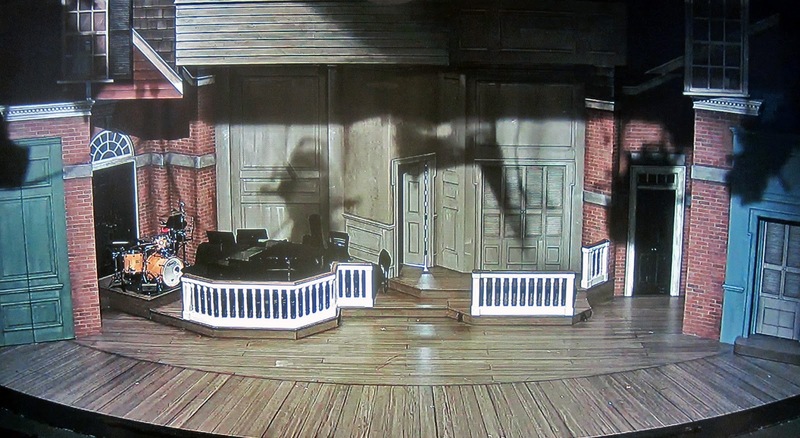 As a fully formed musical, the set and the costumes were critical, especially with frequent costume changes and the limited space on the stage. Scenic designer Michael Amico emphasizes functionality above all because of the space and large cast. Brian O'Keefe’s costumes were equally functional, period perfect, and numerous. In one scene there are actually 31 quick-change of costumes! Lighting design is by John Hall, and video design is by Sean Lawson. Michelle Petrucci is choreographer and assistant director. Sound design by Brad Pawlak adds an additional layer of drama to the production. James Danford, Dramaworks’ always dependable stage manager, shows his expertise in keeping all these moving parts together. The musical director Craig D. Ames, who doubles as an extraordinary keyboardist, brought out the best in this talented cast and his five piece combo sounded more like a full orchestra. 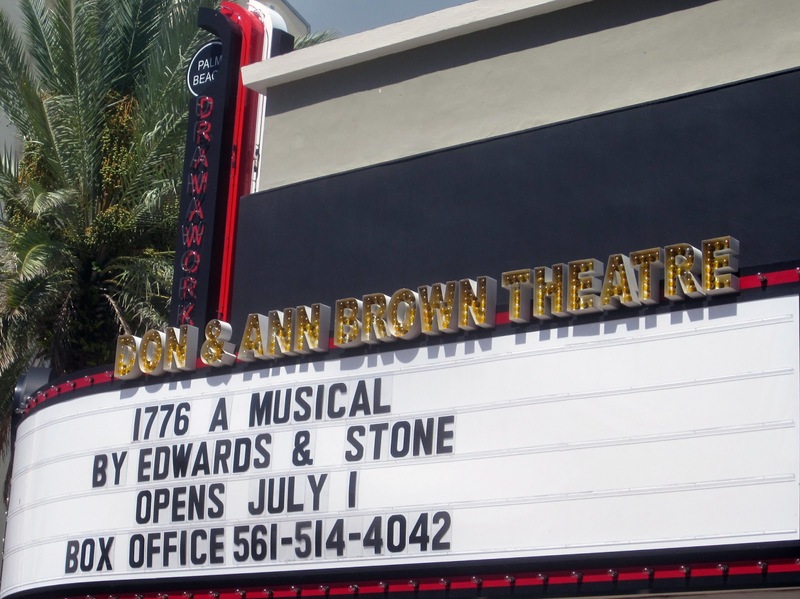 1776 is a must see, not only for its relevancy, but simply because it is one of the preeminent Tony Award-winning American musicals and “reimagined” and presented perfectly by Dramaworks.